The New York Yankees are the New York Yankees again, supreme leaders of the Evil Empire and the best show in baseball. They teased that status by coming within a victory of the World Series in 2017 and trading for reigning National League MVP Giancarlo Stanton this winter. They can etch it in stone by signing right-hander Yu Darvish, the best pitcher on the free-agent market. As reported by FanRag Sports' Jon Heyman, the Yankees are taking a look at Darvish and "are intent on adding a fine starting pitcher." To stipulate: The Yankees don't need Darvish or any other arm. 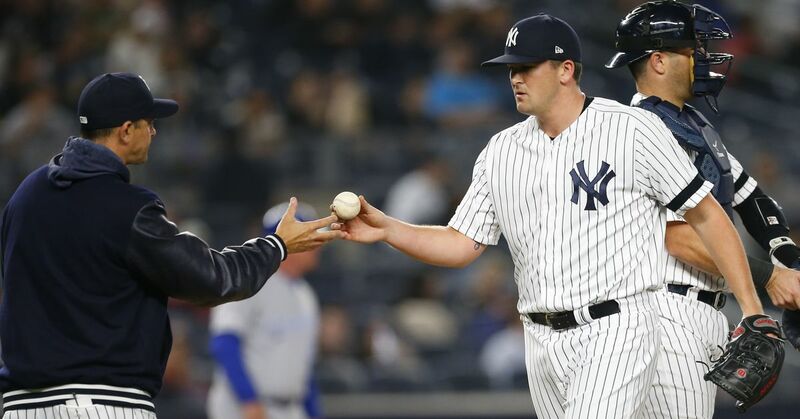 After re-signing veteran CC Sabathia and tethering the big lefty to Luis Severino, Sonny Gray, Masahiro Tanaka and Jordan Montgomery, they've got a more-than-capable starting five. New York starters finished second in the American League with a 3.98 ERA last season. As constructed, they could repeat the feat in 2018. On top of that, the Yanks boast one of MLB's elite bullpens, with Aroldis Chapman, David Robertson, Dellin Betances, Chad Green and Tommy Kahnle leading the charge. Adding Darvish would be icing on the Big Apple-flavored cake. The right-hander comes with crimson flags. He's also the best available pitcher who won't cost the Yankees prospects from their rebuilt farm system. In fact, because Darvish was dealt from the Texas Rangers to the Los Angeles Dodgers at the 2017 trade deadline, he won't even cost the club that signs him a compensatory draft pick. Here's the case for Darvish: He's a four-time All-Star who has twice finished in the top 10 in AL Cy Young Award balloting. He's averaged 11 strikeouts per nine innings across five big league seasons and posted 19 fWAR between 2012 and 2017, better than all but 17 other pitchers. That figure is even more impressive because of a Darvish flaw: He missed the entire 2015 season and part of 2016 after undergoing Tommy John surgery. He bounced back in 2017, notching 209 strikeouts in 186.2 innings between the Lone Star State and SoCal. He ended on a decidedly down note with high-stakes postseason meltdowns for L.A., but that may have largely been the result of pitch-tipping, per Sports Illustrated's Tom Verducci. Pitch-tipping is fixable. A drop in velocity often isn't, and Darvish didn't suffer from that. His average heater clocked in at 94.7 mph last season, a tick above his career average of 94.1. The stuff is there. There's risk associated with giving the 31-year-old a deal in the range of five years and nine figures, which is what he'll surely command. Like many such contracts, it could amount to value on the front end and a painful drag at the back. For the Yankees, however, Darvish would gild a squad that's already equipped to compete for a Commissioner's Trophy now and going forward. In addition to the pitching assets mentioned above, New York boasts a potent offense led by Stanton, AL Rookie of the Year Aaron Judge and catcher Gary Sanchez. That trio alone could plausibly swat 150 home runs. Meanwhile, the Yankees have ample talent marinating in the minors, including infielder Gleyber Torres, right-hander Chance Adams and left-hander Justus Sheffield. The latter two could soon slot into the rotation, offering cost-controlled insurance if Darvish gets injured or requires extra rest. Which brings us to another important point: The Yankees have enough depth on the big league roster and at the MiLB level to treat Darvish with caution, limiting his innings and keeping his arm fresh for October. They can pay him like a horse without riding him into the ground. Speaking of payment, New York has expressed a desire to stay under the luxury tax. "You can have a world championship-caliber team and not have a $200-plus million payroll," principal owner Hal Steinbrenner stated in November, per Newsday's David Lennon. Giving $20 million or more per season to Darvish would push the Yankees past the luxury threshold at the moment, meaning they'd either need to eschew that concern or trade a pricey, expendable veteran such as outfielder Jacoby Ellsbury before Opening Day. New York also needs to shore up holes at second and third base created by the trades of Starlin Castro and Chase Headley, respectively. Torres could fill one slot, but the infield is an area where general Brian Cashman may be forced to expend resources. Will that leave enough to sign Darvish? A better question is, are the Yankees better off spending cash or prospects? They've traversed other avenues to add pitching, as Heyman noted, including the Pittsburgh Pirates' Gerrit Cole and the Detroit Tigers' Michael Fulmer. Either would deplete the club's minor league ranks and undermine the foundation Cashman has labored to build. Better to go the old Yankee way and take a risk on a free agent who will ding only the bottom line and not the farm. The AL East is winnable, with the Boston Red Sox searching for offense and the Tampa Bay Rays, Baltimore Orioles and Toronto Blue Jays all stuck between retooling and rebuilding. The Junior Circuit, as a whole, is ripe for the taking despite the presence of the Cleveland Indians and defending champion Houston Astros. The Yankees can be the Evil Empire again. They can be the best show in baseball. They can add to their hoard of 27 world championships while re-emerging as the undisputed bullies of baseball, all while keeping an eye on the next several years. Which is to say, they can afford to take a risk on Darvish. All statistics courtesy of Baseball Reference and FanGraphs unless otherwise noted.